I have a fondness for the orks of Earthdawn, a race that had only a few echoes of Tolkien’s orcs and D&D’s cannon fodder. The orks of Earthdawn had a unique history of enslavement and rebellion: once they were conquered by the oppressive Theran Empire, but the ones of Barsaive, where the action of the campaigns usually took place, were free people who had to rediscover their history. As they left their kaers after the Scourge, they followed their passions, be they violent or peaceful. Some turned to raiding and pillaging as ork scorcher tribes, but for every one that did, another joined honorable mercenary companies. Others lived among the dwarves of Throal or in their own communities on the surface, as varied as those of humans or any other Name-Giver. And one — a very special troubador named Krathis Gron — fired the hearts of thousands of orks and realized the dream of forging the orks into a nation. This sourcebook lays the seeds for adventures in the world of her making. The creation of this sourcebook is kind of a funny story (or at least it might be to writers). My writing partner Jennifer and I were told that due to problems in the creation pipeline, the book’s start date was delayed, but the development team still wanted to hit the original deadline. We would only have nineteen days to write an 80-85,000-word sourcebook. We did it in seventeen, lost some data due to a computer kerfluffle, rewrote it, and finished it in exactly nineteen. I wrote around 1,500 words a day, and Jennifer wrote 2,500 or more. This was about the time where we realized that tendonitis and carpal tunnel syndrome were very real dangers to game writers, and screenplays seemed to have a much better effort-to-payoff ratio. But. We. Freaking. Did. It. Did the quality suffer? I don’t know. I never sought out much about Cara Fahd from Earthdawn fans after that, so I will only go off of my memories rather than what I know of fan reaction. I felt good creating the actual text of the Seeds of Nation, though I should mention something. Trying to write in the voice of a character with a Charisma of 20+ when my own measures nowhere near that high is always a fun bar to try to reach. We tried to take some cadence and repetition techniques from political speechwriters, but I was 22 years old and writing as fast as I could. In my mind, sourcebooks are always trying to accomplish two major goals: the first is to be idea fodder for players and gamemasters, inspiring them to spend time with the book’s subject. This element should always feel like telling the players, “You think you know X? Buddy, here’s how much more there is!” Most of the book is devoted to the NPCs the players will interact with, a sort of “Earthdawn By Way of Jane Austen.” It’s rules-light, but I think it works. 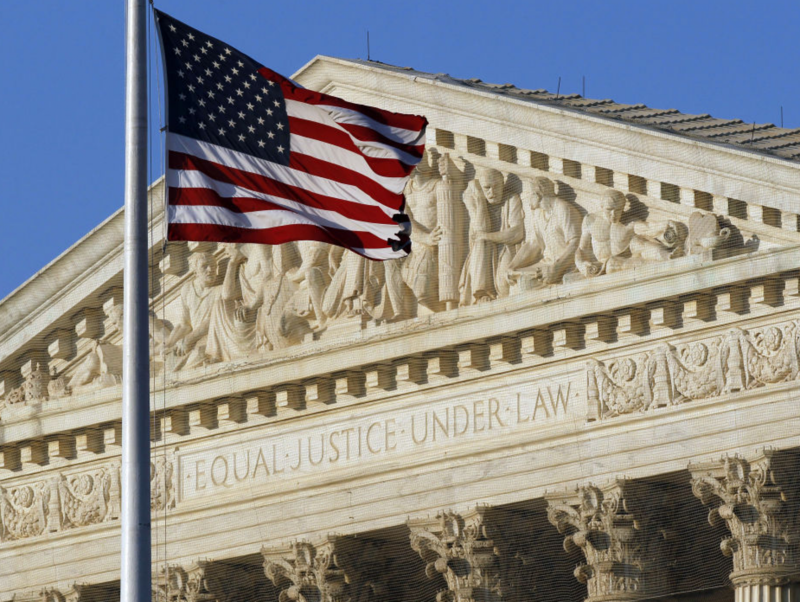 The second goal is to write rules that codify some of the world in a way that helps solve problems before they begin. One of our goals was to make cavalryman adepts happy — we had one in our home campaign, a straight-up vanilla Ork Cavalryman with stats from the basic book. Before Cara Fahd, it always felt like he was the least glamorous of the PCs compared to the suave t’skrang swordmasters and super-useful spellcasters. With the publication of Cara Fahd, I always felt like your starting PC’s ork could pick out what tribe their family was from, or if they created their own, the GM now had ready-made rivals. The only major thing on the cutting room floor was about 5,000 words of a mass combat system. I don’t miss it much. It wasn’t essential to this particular sourcebook: a war-related book would be a better fit, so I see why it got cut. So I don’t regret much about Cara Fahd. Orks can swallow their gahad on a regular basis, so if it comes to a little thing like regret, I’m sure they’d eat it for breakfast. 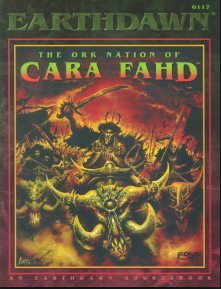 The Ork Nation of Cara Fahd is available here and was reprinted as “Nations of Barsaive, Vol. 3: Cara Fahd” when the rights to Earthdawn were sold to Mongoose Publishing.